A pattern has been brewing for a while in the schema of meal-planning: Despite the best intentions I lack interest in cooking on most Friday nights. We rarely go out on Fridays, preferring to end a busy workweek with a relaxing evening at home. But that tempo is reflected in the kitchen as well. The longer the week wears on, the less interested I am in standing at the stove. 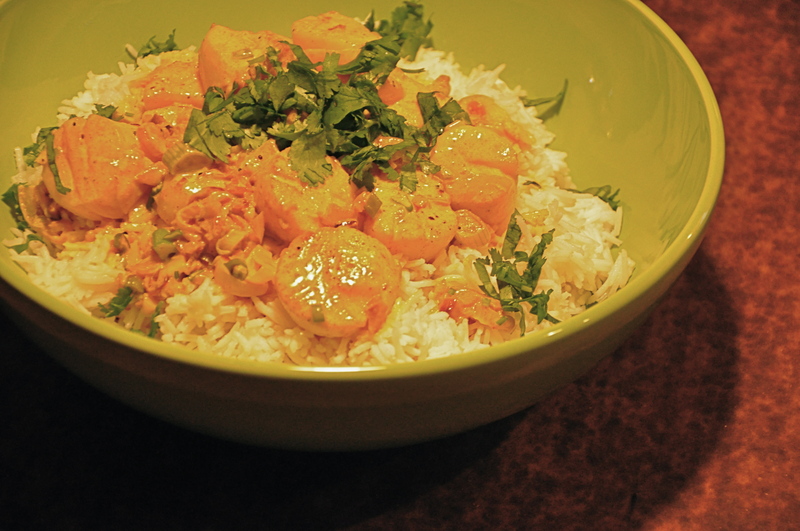 As usual, we started off fairly strong on Monday with Scallops in Curry Sauce — actually rescheduled from the previous night’s plans (I’ve found Sunday nights are just as likely to burn out as Fridays.) In this case, the scallops proved to be the highlight of the week. We moved into Tuesday with a homemade carrot ginger soup and ravioli with bacon and chard. I’ve been hankering for the carrot soup ever since our trip to NYC, but my homemade version from one of the Seattle Junior League cookbooks just didn’t come close to my fabulous snack in the Village. The search goes on. Wednesday’s barbeque ribs in the pressure cooker prompted one of my frequent warnings about becoming a vegetarian. “You always say that,” my husband noted. It’s true, my body keeps talking to me. On Mother’s Day we stopped by Whole Foods to pick up a picnic lunch. The options seem endless. The guys picked up sushi, turkey sandwiches, chicken noodle salad. I went for the tempeh, kale and chickpea salad — a subconscious response to an overload of carbs and meat the day before. I rally on meat for the kids at home because they’re not ready for the tofu-and-beans route anytime soon. It’s no surprise, for instance, that bacon was a major appeal in Thursday’s Spaghetti Carbonara. So what to do about the Friday flame-out factor? We’ve resolved that Fridays will be subject to the whims of the week. Sometimes it’s a time to cook together, be creative, and enjoy the easy pace of a late dinner at home. Other times I’ll be reaching for the phone. Be the first to comment on "Friday night flame-out"